MotoBabble is a social network specifically built for the automotive industry and will completely change the way you interact with cars and trucks. 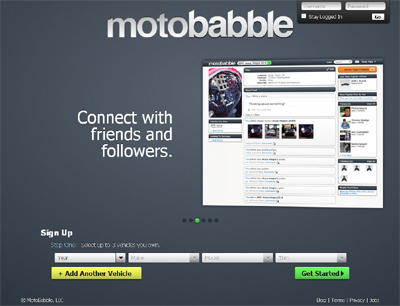 MotoBabble allows you to share anything about your vehicle. Start discussions, create photo galleries, post comments, follow other vehicles, share tips, easily list modifications, and find your friends. We are currenly in Beta testing. We provide efficient content search and the most simplistic navigation in the automotive vertical. Our customizable communities allow users to follow topics that specifically interest them and our social features keep users fully engaged in all aspects of their vehicle without having to hop around different web sites.